What Is A Luxury Portable Restroom? Royal RestroomsPortable Restroom TrailersWhat Is A Luxury Portable Restroom? Whenever your special event requires something similar to permanent facilities, Royal Restrooms can offer an assortment of portable restroom trailer options. Our luxury bathroom trailers range in size and usefulness that can fit the requirements of any job or special event. All bathroom trailers are equipped with flush toilets and running water sinks for your sanitation needs. If you want a little more luxury, our larger restrooms offer heating and air conditioning, sound systems, luxurious sinks, and separate stalls. Royal Restroom’s luxury restroom trailers provide private restrooms and suites that have the most beautiful high-end finishes sure to amaze your guests! We work with the best manufacturers that specialize in flawless craftsmanship and excellent interior quality designs. Your guests will enjoy all the conveniences of home with many added qualities that will even surprise the most selective crowds. Easily, one of the reasons to rent a restroom trailer over a traditional portable toilet is style, creature comforts and luxury a portable toilet cannot provide. A restroom trailer is luxurious; with toilets that flush, sinks for hand washing, vanity mirrors, and exquisite lighting, unlike a porta potty. Restroom trailer comforts; with walls that are insulated, A/C and heat controls and large interior spaces. 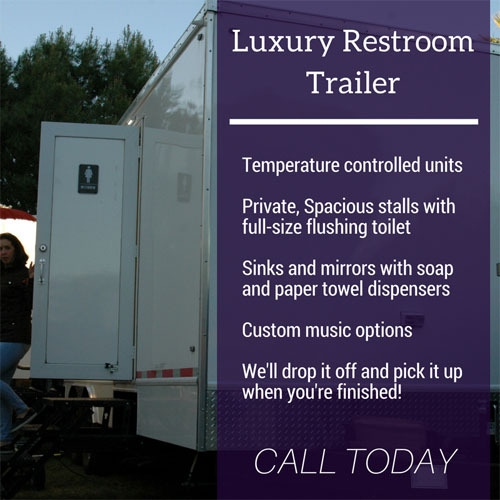 Our exclusive portable toilets are modern & sophisticated; high-end hardwood or tile flooring, marble or granite sinks, and some of our trailers even have music in the background. Our restrooms interior is also improved with attractive artwork, tabletop accents and more. At Royal Restroom’s we know you will be astonished by our personal attention to detail and dedication to our continuous customer service. We take our reputation to heart and work hard to help you maintain and build your reputation, as well. Luxury portable restrooms establish your commitment to giving your guests at your special event a top-quality experience in every single way. Call Royal Restrooms today and up the ante at your event with the absolute top of the line in luxury portable restrooms that are head and shoulders above the rest. We honestly will take your special events to the next level. Give us a call at (480)734-9809 today! How Much Does Porta Potty Rental Cost?